The Blade is one of Wilson’s most popular racquets in recent years. It is has a rather low weight but is still stable due to having more weight in the head than many other racquets in the same weight range. Find out more in this Wilson Blade 98 Pro Stock Racquet Review. 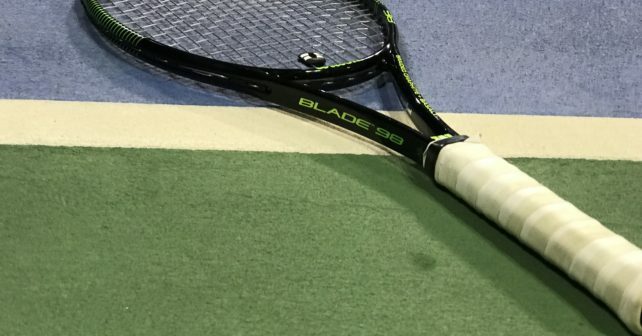 The idea with the name “Blade”, is that you can really carve the ball and it is definitely a more controlled racquet than a Wilson Burn a Babolat Pure Drive for example. The one I tested has an 18×20 string pattern, but there are also Blades with a more open 16×19 string pattern if you need a bit of extra spin. What is the difference between a pro stock Blade and a regular Blade you buy in the store? Well, the pro stock Blade comes in a light hairpin, has a shiny paint instead of the usual matte paint, often has silicone or foam in the handle added by the Wilson pro room, and comes with whatever stiffness or mold the professional player desires. The Blade 98 pro stock I’ve been testing is painted like my favorite version, the green and black one of 2015, but there is definitely something else underneath. I am not exactly sure which version of the Blade it is, but with a measured RA of 62, it stands a bit on his own since the kFactor that is used by Stefanos Tsitsipas and David Goffin for example, has a slightly higher stiffness. This racquet does feel like a beefed-up K-factor, but I can’t tell for sure as the Blades look very much alike. No matter what, this racquet that used to belong to a pro player, is very solid. There is silicone in the handle, but no lead tape underneath the grommets and the racquet weigh 336 grams strung with a 33 cm balance. So this cannot be close to 304 grams of unstrung retail stock weight. The swing weight is likely in the 340s which makes the specs quite close to what Raonic, Tsitsipas and Goffin reportedly are using. It seems like younger pro’s are using lower swing weights these days. Not like stock recreational racquets, but at least lower than the more season pro’s or retired players. These were the unstrung specs of the racquet according to Pro Stock Tennis. I added two overgrips to compensate for the L2 grip size since I usually use L3. Unstrung weight: 10.8 oz. / 306 gr. The racquet has a relatively chunky swing weight and you need to prepare properly and hit with good technique to really make use of it. When I was playing well, the racquet made me feel like a pro, but when I was tired and moving poorly, the racquet felt demanding. On volleys, this racquet was rock solid and on serves, I felt I could hit with control pace. It is a lower launch angle than 16×19 pattern racquets, but that is what gives it that extra sharp slice. This makes me think that the Blade is probably the most aptly named racquet of all Wilson’s models. This racquet is a really versatile stick. Not over-powered, not low-powered, not a spin monster, not a scalpel. Just a solid performer, that works both for attacking the net like Raonic and playing fast-footed defense like Goffin. It is easy to see why a lot of players like the Blade. 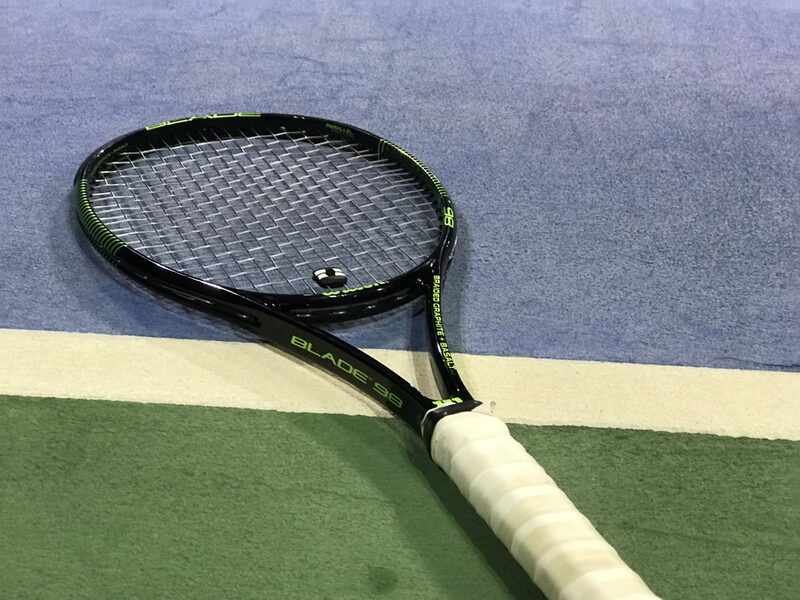 Wilson offers three popular 98 sq inch pro stock racquets, the H19, which is very flexible and similar to a PT57A, the H22 which is slightly stiffer but has a more even flex in the string bed and doesn’t cup the ball quite as much, which I feel enlarges the sweet spot. And the Blade, which is similar in many ways to the H22, but even stiffer depending on what mold is underneath the paint. I never had any comfort issues with this Blade 98 pro stock, but I never felt completely at home playing with it either. It is a really nice racquet for control-oriented players that still crave a bit of extra power, but I prefer the H22 as it has a bit sweeter feel. I do think it does most things well, but I did not find this Pro Stock Blade much better than a weighted up retail Blade. I was not a fan of the Countervail version because I did not think it gives me enough feedback, but the 2015, nBlade 98 or kFactor version deserves a place in many players racquet bags. What do you think of the Blade 98 pro stock? And what do you think when it comes to retail racquets vs pro stock racquets? Please comment below. I play with the 2015 Blade 18×20. Great racquet. But seems they crack quite easily. I only have one left now and tried the Blade CV but it lacks the touch and feel of the 2015 blade. Other than eBay, is there anywhere to pick the 2015 version up from? Never had issues with cracks, but I did with the kBlade so maybe something with the Blades? I think some online shops might still carry the model, but it is quite hard to find. If I see it somewhere, I will let you know! Do you prefere the 2015 Blade over this pro stock blade? what are the better, worse attributes of both rackets?